This is a rather thick cream when squeezed out but lathers up very nicely and feels very lovely on my skin. I like the scent which is fresh but grounded, if that makes sense. Its a nice facial wash to use in the mornings and it leaves my skin feeling clean but not stripped. I like using this one with the Clarisonic Mia the few times I tried. I reckon its worth taking a look at. This is the day moisturizer which comes in a bottle, hence my complaints about packaging above. I had to shake it out – it does not pour out readily, and the amount dispensed each time is quite different. A pump or squeeze tube will ensure more consistent amounts. As it had SPF I only used it in the day and its not too bad. Its not heavy nor oily and there is a light scent. The SPF is insufficient here in the tropics, so I always top up with another sunscreen. My sample lasted me slightly over a week, so I can’t tell the long term benefits but in the short term, it felt quite nice on the skin in the day. The thing about eye creams is that I never quite know what to look out for. The cream is light but creamy and I used the sample day and night. It was not oily which I appreciated, and it did make the skin around my eye area look more moisturized as opposed to not using anything. But with just a week to gauge, I can’t tell its long term benefits either. Disclosure: Featured samples were provided by PR for consideration. For posting guidelines please read my disclaimer. PREVIOUS POST: Essence Metallics Quattro Eyeshadow 03 Copper Rulez : You Rulez Yo! i actually bought a sample kit from their website too. but it consists of scrub, day emulsion and night cream,they felt oily on the first use, but after that I find them quite nice 🙂 and and i LOVE the mini bottle!!!! Ooh can’t wait to hear about the scrub – read that its quite good. I heart the packaging! But if it’s not user-friendly, that’s just meh. Reminds me of a Clinique DDML bottle I have, hated that I couldn’t control how much product came out. Totally agree with you about the packaging – absolutely gorgeous but definitely less-than-practical. For some reason I’m not quite into Benefit though, maybe because their makeup range is a little too cutesy for me (once I got over my mad about Benefit phase a couple of years back). 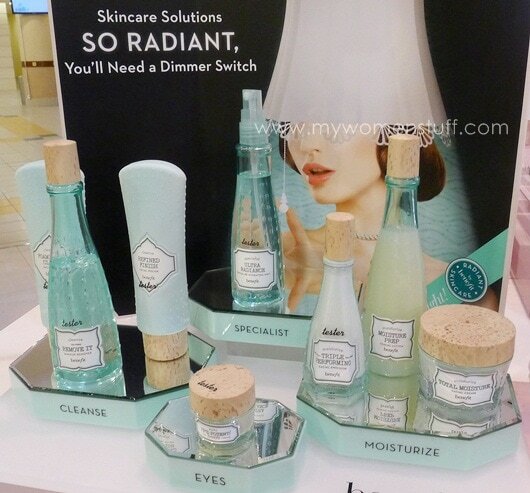 Haven’t quite heard much about their skincare range – it does seem to be relatively new? Or maybe just not quite as promoted as their cosmetics? Or I’m just some kind of mountain hermit? Whatever the case, brightening isn’t quite one of my main skin concerns so don’t think I will be venturing into this anytime soon! The skincare is new – I believe it was launched just a few months ago internationally hence the lack of reviews. Its targeted at the young and possibly new to skincare or Benefit fans. I’m not about to change my own skincare for these which are cute, but a little too basic for my needs. I’ll have to finish my current Clinique stash before I start venturing to other brands of skincare!! Yikes! But, having said that, I’ll just chicken out and restock, ahahaha. Well I’ll be sticking to the ones that work for me thats for sure! The faux cork caps do look really nice. I think it’s so cute. The packaging looks nice too, but if the facial emulsion isn’t very liquid, I can see the problem in dispensing the right amount each time you use it. Otherwise, they seem quite promising! oooo… i almost bought the cleanser but i read somewhr that it’s for dehydrated skin or something so I didnt buy it 🙁 my skin is oily… i’m finally getting my first benefit product!!! my cousin is getting the porefessional for me 🙂 heheheh….. cant wait to try it out! I haven’t tried Porefessional but I hope it works for you 😀 Thanks for the kit info too!